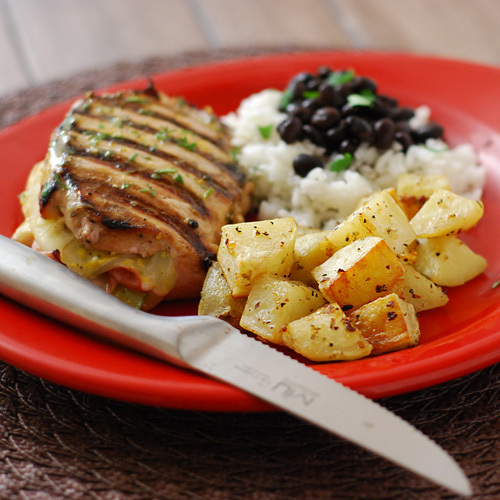 If I didn't already love a Cuban sandwich, when I saw this recipe for Butterflied Cuban Style Pork Chop from Bobby Flay I probably would have thought the man "done lost his mind". 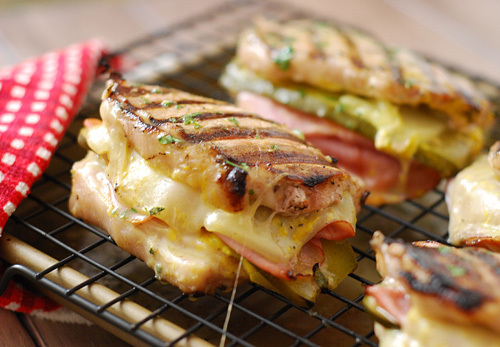 It's basically a Cuban without the bread. 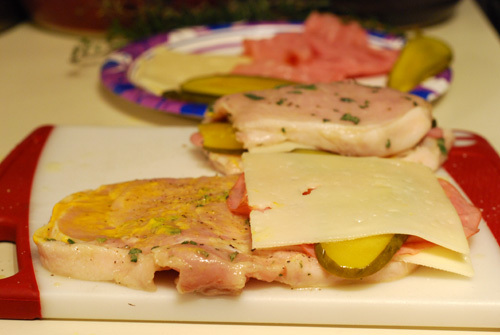 It's a butterflied pork chop, stuffed with Swiss cheese, ham, and pickles. It is an admittedly weird combination but it works quite well. Like many folks in the comments section in the linked recipe, I added mustard to the inside because you have to have mustard on a Cuban. At least I do. For sides, I wanted something super easy because I was feeling as lazy as a sloth tired from working hard all day. 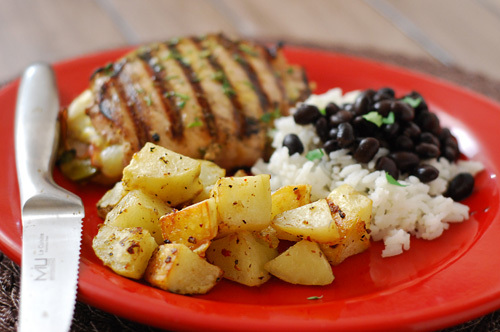 Along with black beans and rice, I made these simple but delicious Cuban roasted potatoes. Preheat oven to 400f. These would also work in a grill set up for indirect heat. Place potatoes in a zip top Glad bag (gallon size). Sprinkle in the Cuban Seasoning and pour in the oil. 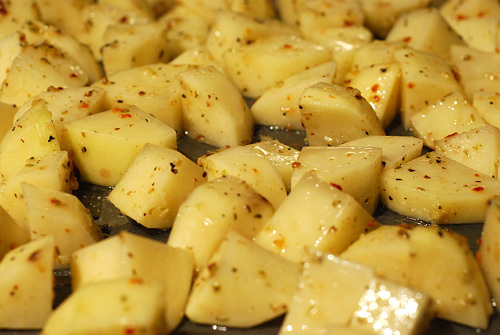 Shake, toss, twist, agitate and otherwise manipulate to cover all potatoes with the oil and seasoning. Empty the bag onto a rimmed cookie sheet into a single layer. Roast on the middle rack in the oven for 30 minutes, flipping the potatoes around every 10 minutes. The potatoes were ridiculously easy and tasted great too. Use a very sharp knife to make the butterflying easier. 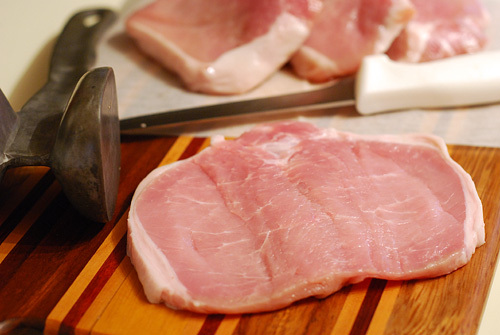 Lay all of your stuff on there and then just close the pork chop like a book. 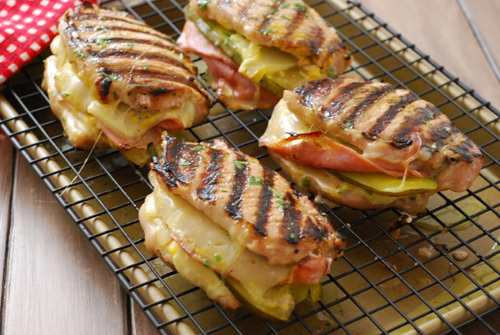 Grilled and resting on a raised rack. One of the first things a new acquaintance often will say to me when he/she learns that I BBQ and grill is, "I watched that show, BBQ Pitmasters." Well guess what. A new season of BBQ Pitmasters is starting up this Sunday (Dec 16) at 9pm EST on the Destination America channel. Producer John Markus was on The BBQ Central Show a few weeks ago and talked with Greg Rempe about it. From what I recall, they are calling it Season 3.2 instead of Season 4 because it's kind of a mini-season before next year. The format will be different for this shortened version. There won't be an overall grand champion, each week will just have a winner. Each week will be a regional competition like, best Texas style BBQ or something like that. While I prefer the more traditional BBQ competition formats (Season 1, some of Season 3), I'm actually looking forward to this mini-series too. So don't call me at 9pm on Sunday night. I'll be watching BBQ Pitmasters on Destination America.